And they make the observation that the polestar could not be seen from south of the equator on a ball earth. That may or may not be true but certainly is a good point and merits further research. Flat earthers fail to mention that if the earth was flat we could see the polestar all the way down to Antarctica. On a flat earth you should be able to see the polestar from everywhere. Flat earthers can’t explain why there would be a southern polestar around which the southern stars rotate. Some deny this occurs, and suggest it is different to what happens in the northern sky. There is a need for research in this area and as I am living in the southern hemisphere I plan to do some work in this area and post my conclusions in the near future. Conclusion: Interesting points are raised that deserve further research and investigation. Certainly it is very difficult to believe the earth is moving the way the globe earth model suggests and at the same time is able to always keep the north pole pointing directly at the polestar. And we need to further investigate exactly what is happening in the southern sky. 101) Sigma Octantis is claimed to be a Southern central pole star similar to Polaris, around which the Southern hemisphere stars all rotate around the opposite direction. Unlike Polaris, however, Sigma Octantis can NOT be seen simultaneously from every point along the same latitude, it is NOT central but allegedly 1 degree off-center, it is NOT motionless, and in fact cannot be seen at all using publicly available telescopes! There is legitimate speculation regarding whether Sigma Octantis even exists. 102) Some heliocentrists have tried to suggest that the Pole Star’s gradual declination overhead as an observer travels southwards is proof of a globular Earth. 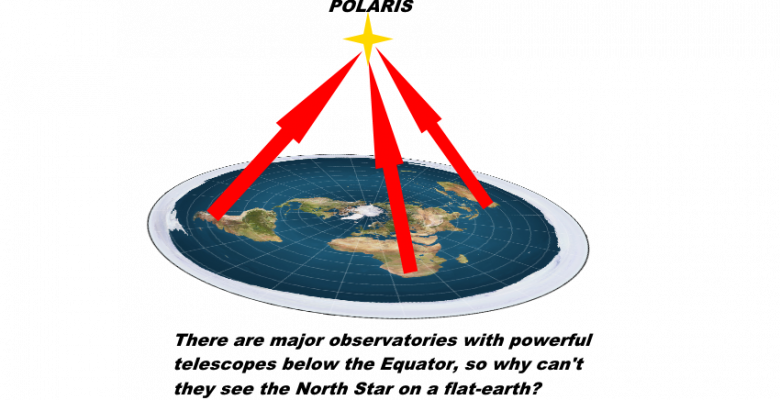 Far from it, the declination of the Pole Star or any other object is simply a result of the Law of Perspective on plane (flat) surfaces. The Law of Perspective dictates that the angle and height at which an object is seen diminishes the farther one recedes from the object, until at a certain point the line of sight and the seemingly uprising surface of the Earth converges to a vanishing point (i.e. the horizon line) beyond which the object is invisible.